Home/Blog/What Is Trigeminal Neuralgia and What Role Does the Neck Play? Trigeminal Neuralgia is a condition that involves the trigeminal nerve. This is the nerve that is related to sensations in the face. As a result, this is an incredibly painful condition that can be triggered by the simplest of things such as smiling chewing. What are the symptoms and causes of trigeminal neuralgia? If the pain is in your face, how is the neck involved? Why is upper cervical chiropractic something that you should consider as a way to find natural relief? We will address these important trigeminal neuralgia topics and more in our article. The trigeminal nerve involves three branches that reach throughout the face. Thus, the location of the pain depends on the part of the nerve being affected. One branch goes above the eye, one extends below the eye and to the upper cheek, and the third extends along the jawline. The length of time the pain lasts is an important factor in diagnosis. For example, longer lasting face pain can be an atypical symptom of migraines. The good news is that the natural care we will be discussing later also has benefits for migraineurs. Other potential underlying factors include multiple sclerosis and issues with an intracranial artery (the latter being the most common cause). In the meantime, you may be dealing with some of the common treatments for TN which primarily includes a concoction of anticonvulsants. These are powerful drugs that can produce many and varied side effects, especially if the dosage is not regulated properly. 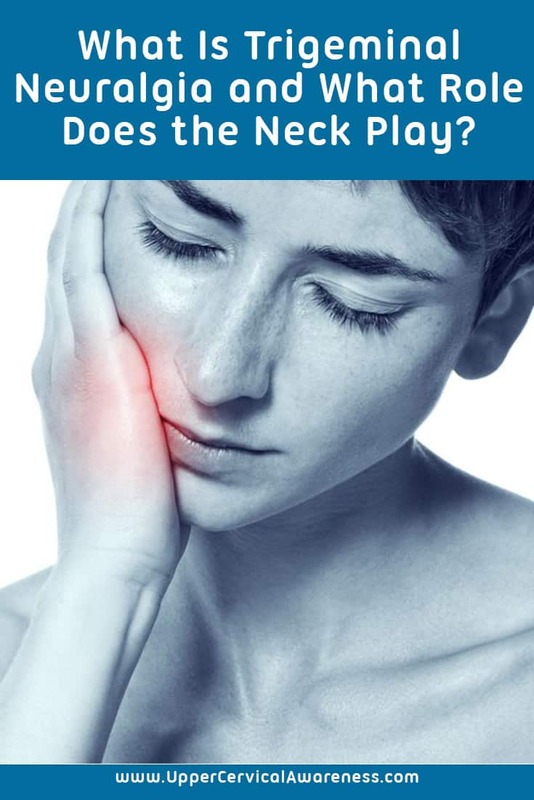 How Is the Neck Related to Trigeminal Neuralgia? Placing pressure on the nerve – The location of the atlas allows for a misalignment to place pressure on the trigeminal nerve. This irritation can lead to trigeminal neuralgia symptoms. Affecting intracranial arteries – The vertebrae of the cervical spine have tiny loops of bone called vertebral foramen. Their job is to provide safe passage for the vertebral arteries that bring blood to the head. However, a misalignment can have a negative effect on blood flow and on these arteries. Inhibiting brainstem function – The atlas surrounds the brainstem, so it doesn’t have to move very much to go from being a protector of this vital component in the central nervous system to being an irritant to this part of the body. Since the signals from the body are sent through the brainstem, any inhibition in function can result in pain and other issues. In one case study involving trigeminal neuralgia and upper cervical chiropractic care, the doctor detected an atlas misalignment in a 58-year old woman who had been suffering from TN attacks above her right eye for over 6 years. From the time she started care, she did not report another attack. In another study involving a 68-year-old female who suffered from TN for 7.5 years, her pain levels were gradually reduced, and she was 4 months without pain at the time of publication of the study. This occurred despite the fact that she regularly disregarded the advice of the practitioner and often showed up for appointments only if she was in pain. She noted 50% improvement after just her first session. While not an upper cervical practitioner, the doctor noted her issue stemmed from the cervical spine (neck). As you can see from these cases, there is a link between the alignment of the top bones in the neck and the way the trigeminal nerve functions. Therefore, it makes sense to see an upper cervical chiropractor if you are suffering from TN. What makes upper cervical different? Upper cervical practitioners focus on the top two bones in the neck, the very ones that are most likely to affect the trigeminal nerve, blood flow to the head, and the brainstem. Diagnostic imaging is used to take precise measurements of the misalignment. Then, gentle adjustments are tailored to meet each patient’s needs. This allows for safe and long-lasting low-force corrections to be used. When adjustments are gentle, they tend to hold longer. Your body doesn’t fight against it the way it would a forceful adjustment such as having the neck popped or twisted. As a result, the body has the time it needs to heal from the damage the misalignment was inflicting. Thus, results can be both immediate as well as gradual, as noted in both cases above. If you are suffering from trigeminal neuralgia, give upper cervical chiropractic a try. A consultation with a practitioner near you may be your first step down the path to experiencing less face pain or even no face pain at all. Call us at 207-846-5100 and ask for a complementary consultation.